S&T’s TSBroadcaster is the market-leading advanced delivery system for interactive applications for digital television, providing continuous application insertion and play-out, data updates, signaling and stream event generation. TSBroadcaster’s reliable, scalable technology provides DSM-CC object/data carousel and streamer solutions that can be integrated with your existing systems via a comprehensive API. It is designed to be fully compliant with worldwide television specifications, and the core functionality of TSBroadcaster includes support for HbbTV, MHEG, OCAP, EBIF/ETV, MHP, DVB SSU and Common Download. 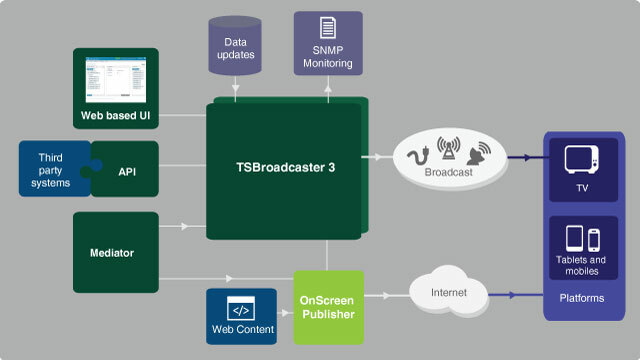 TSBroadcaster is built to withstand the rigours of modern broadcasting, providing control and monitoring via a web-based UI and SNMP. TSBroadcaster’s scalable functionality provides operators the means to develop, test, play out and manage content across major networks. TSBroadcaster serves content to many millions of customers on five continents and has very high inherent reliability as well as redundant modes of operation. We deliver systems on a range of approved Linux platforms, providing prompt shipping and installation. Worldwide support is provided from S&T offices in London, Boulder CO and Hong Kong. TSBroadcaster® is a registered trademark of Strategy & Technology Ltd.